I recently received a £5 Amazon token for filling out a survey. But what to spend it on? 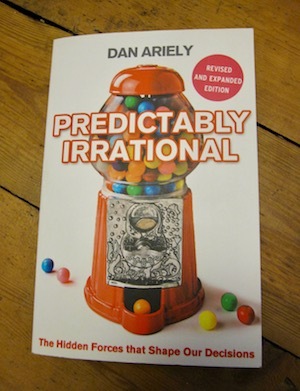 Alan Cooper of About Face fame suggested reading anything by Dan Ariely, so I looked him up. In the end I chose Predictably Irrational. It is in a similar vein to Thinking Fast and Slow by Daniel Kahneman, but written in a slightly less academic way. Do not let that you put you off, if anything it is a positive, making it a quick and entertaining read, but still providing some very interesting food for thought. For each of his ideas he sets up experiments to test them and see if we humans really are the sensible level headed decision makers the economic behaviourists would like us to think we are. For instance we are more likely to cheat and steal if there is no money involved. That sounds crazy, but think about it, how many times have you taken a pencil/pen home from work - that does not feel like stealing, but it is if you did not pay for it. I was also really interested in the chapter about how possession of an item changes your thoughts on the value of that item. This is why we think people ask for too much when they are selling an item, we do not have all the emotional investment and memories that the seller has yet. But once we own that thing, then our asking price will go up too. And what does all this have to do with UX I hear you ask? By understanding a little better how people make decisions and think in general I hope that I can design better interactions which will help people to use the systems I design, whether it is something massive like a new navigation system or something small like a pop up telling them an item has been added to their basket. Dan’s book is an interesting read and would be a great place to start if you are interested in learning more about how people think.